Phasers are not the most popular type of guitar effect among boutique builders. There’s only so much ‘flavor’ you can add to filter type effect, so many boutiques simply leave phasers for the mass production brands to deal with. However, the Red Witch has proven this understanding of things to be completely wrong. Their Deluxe Moon is one of the most generous phaser pedals on the market. The thing looks simple and even somewhat underdeveloped for a phaser pedal, but it shows its full potential once you plug it in and start messing with the controls. Red Witch has a pretty specific way of how they do things. This relates to both the interior and exterior design of their products. Following with established tradition, we get a sort of an ‘occult’ name and graphical aesthetics that follow closely behind. The enclosure of the Deluxe Moon is pretty tough and inspires confidence when used. Controls come in form of three knobs, which is not as much as you get on something like modern Boss phasers, but it’s more than versatile enough. Speaking of which, this pedal comes with stereo outputs as well. Most phasers you can get these days have the controls dedicated to fine tuning the frequency, depth and resonance of the effect, but they also come with stage selector in most cases. Red Witch Analog Deluxe Moon doesn’t give you that, but it’s actually not a flaw in this case. The controls you do have available are three knobs named, Velocity, Trajectory, and Cosmology. The first one is your speed or frequency knob. Trajectory defines the depth of the ‘dip’ and overall shape of the effect. Now, those two are somewhat easy to figure out without referring to the manual, but Cosmology is something that you definitely need to read up on before use. In short, it allows you t choose between 3 phase styles, 2 thremophase type effects, and one tremolo effect. The whole idea behind a rather costly boutique phaser falls apart rather quickly unless that pedal is capable of bringing something tangible to the table. Luckily, Red Witch Analog Deluxe Moon does that and so much more. With the controls available, you can achieve such an impressive range of phaser effects while the additional tremolo and tremphase options offer some pretty interesting results as well. This is the type of pedal that you need to get to know first, and then spend months being surprised by its different and new facets. When you buy boutique, you are looking for that premium sound and performance. Even though it’s ‘just a phaser’, Deluxe Moon give you this exact type of experience. The pedal is versatile even though it lacks some standard features, and it has so much range. Whether or not worth getting over some more commercial models depends on how dedicated you are to building a personalized tone. From a completely neutral standpoint, this pedal has a lot to offer. 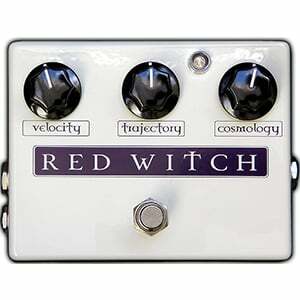 For more info about the Red Witch Analog Deluxe Moon, click here.